That rings in my head. It’s got to be a slogan for some company, although I’m not sure what at the moment. It’s possible that it’s just a rhyme I’ve made up to. But it’s sticky. No, not like fried sticky. It’s an idea–and a health habit–that sticks, i.e. has staying power. Nothing truly good comes from anything fried, not in the long-term (health wise) or in how you feel right after eating something fried. Shortly before the 4th of July this year, a friend of mine indulged in a fried mac-and-cheese burger from Zombie Burger in Des Moines. 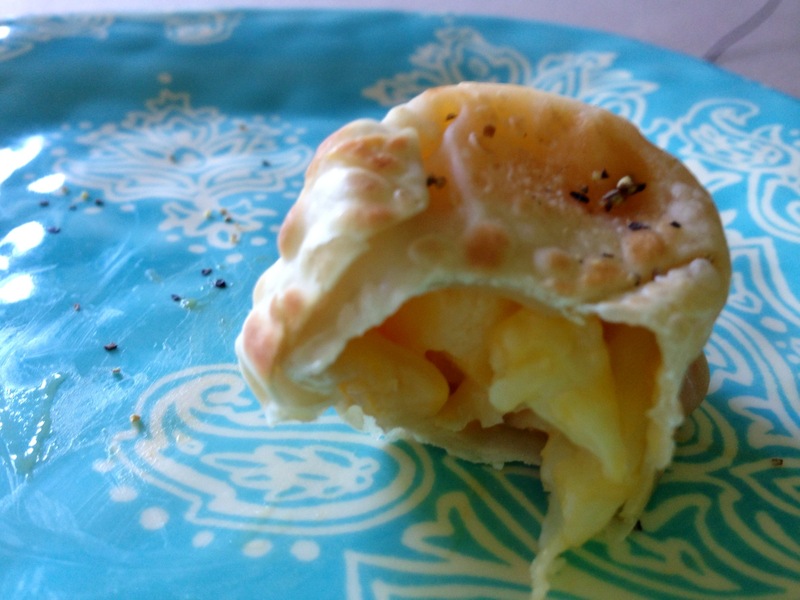 The thing was a spectacle with it’s layering of mac and cheese and “buns” made as large mac-and-cheese bites, similar to the ones made popular by Sonic and other fast food chains. Was it comical? Absolutely. Did it make everyone cringe a little? Yes. There’s something appealing to us Americans about indulgence and extremes. I get that. But we also know better. Epilogue: Dear friend did not finish that burger. He took the rest for lunch the next day, his girlfriend squealing uncomfortably at the thought of it being reheated. My purpose in telling you this story is to lead you to another option. 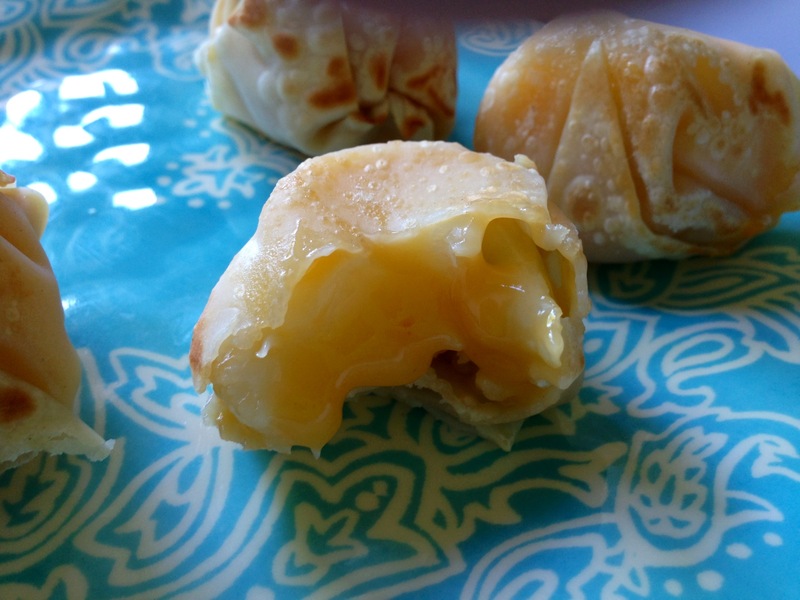 You know I’ve been experimenting with egg roll wrappers lately, and so with some cheesy cauliflower left over from my Healthier Mac-and-Cheese You Can Microwave, I set out to make an appetizer comparable to the cheesy, carby bites so many crave, sans the grease. How’d they turn out? In my humble, disapproving-of-all-things-fried opinion, REALLY GOOD! Perfect crunch. Perfect amount of cheesiness, and anything but hard to make. Preheat your oven to 375 degrees. Lightly grease a mini-muffin tin, or a regular cookie sheet if you don’t have a mini-muffin one. Set aside. 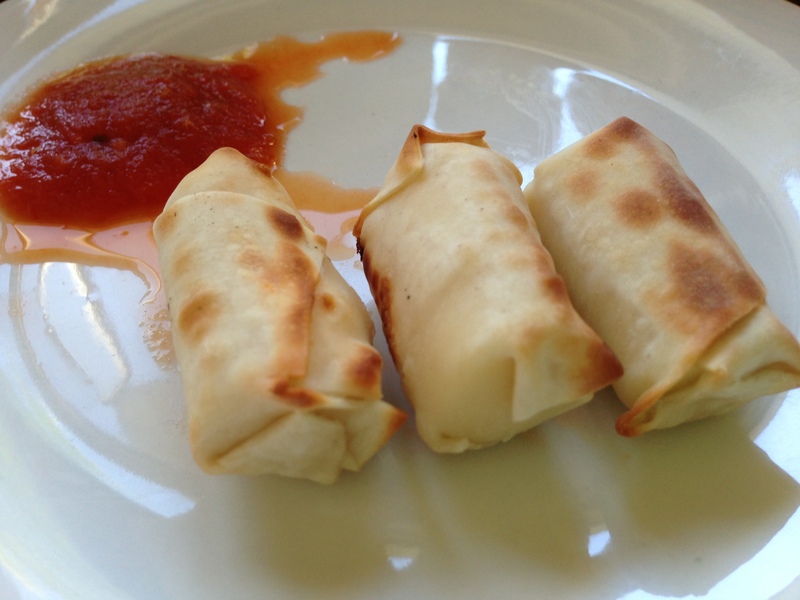 Using a pizza cutter, slice the egg roll wrappers in half to get two triangles for each square sheet. Gently press the middle of each triangular wrapper into the tin or lay flat. In the center, spoon in warmed cheesy cauliflower mix. Be conservative in how much you spoon in. A little dollop goes a long way. The next part is tricky. Fold the edges of the wrapper over and tuck them under the bottoms to form the ball. You’ll have to finagle them a little to get them just right, but keep calm and fold gently. When you’ve achieved folding that makes them look like small balls or popovers, pop them in the oven for about 7-9 minutes, or until the outer edges are brown and crispy. Serve warm in a favorite dipping sauce or with a sprinkle of pepper as I did. Enjoy! True fact: Up until this point in my life (just a day shy of 24) I have avoided that lumpy white sludge they call cottage cheese. What about it is cottage-like, I wonder? The wordie in me likes to think this unattractive, lactose-filled allergen wonder was snarkishly named in memory of a grandparent gumming lumpy cheese back in the holler somewhere. That’s the story in my head that I’ll stick to. 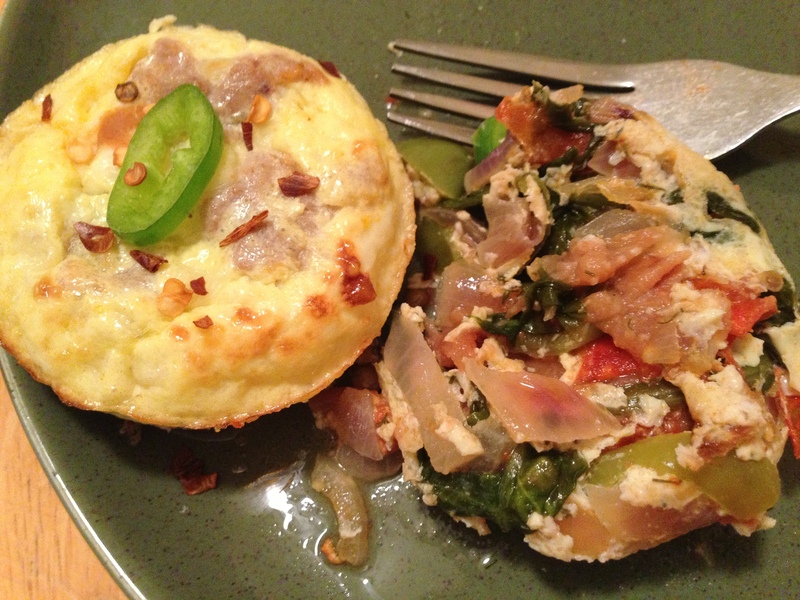 On to more serious points, when I tried this recipe a few weeks ago–with my own single-serving adjustments–I was surprised, and pleasantly surprised at that. But does it bake down into a delicious light, eggy crust? Absolutely. Paired with sauteed veggies and legumes, this recipe might be worth sharing with my own grandma and Nana. 1. Sautee vegetables, spices and spinach over high heat until tender. 2. Preheat oven to 375 degrees. Line muffin tins with muffin liners (or grease really really well). 3. 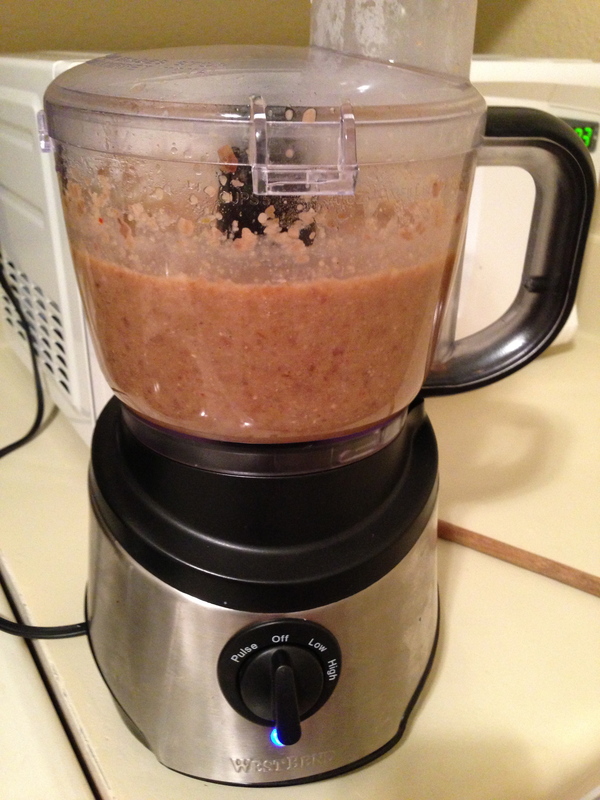 Spoon veggie mixture into muffin slots, filling each about 1/2 full. Then evenly divide and spoon the beans on top. 4. In a small bowl, whisk egg and cottage cheese together. 5. 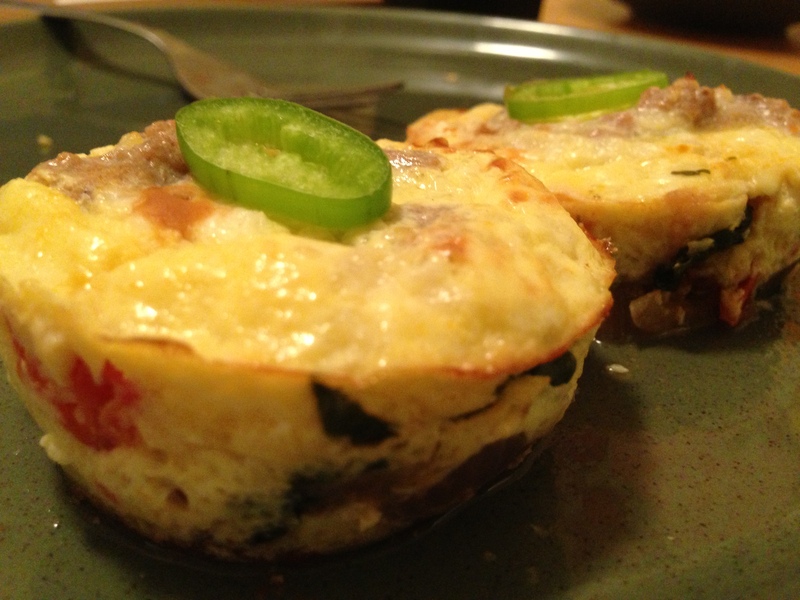 Spoon egg mixture over top of veggie cups. 6. Top with additional paprika and cayenne, if you like. 7. 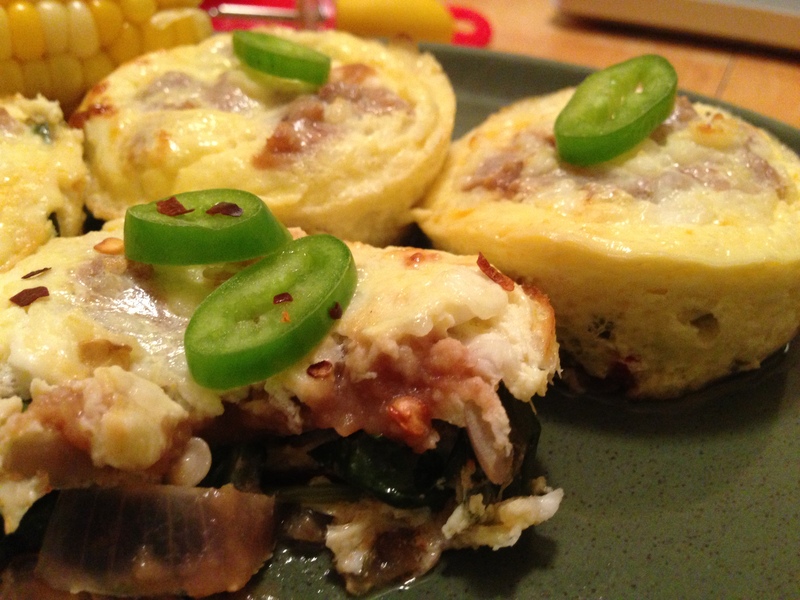 Bake for 20-25 minutes or until eggs are set. If they’re taking a while or if you’d like a crispy golden finish, set the oven to broil for 1-2 minutes, but be sure to remove quickly so they don’t burn. Use a spoon to remove and serve warm. Enjoy! 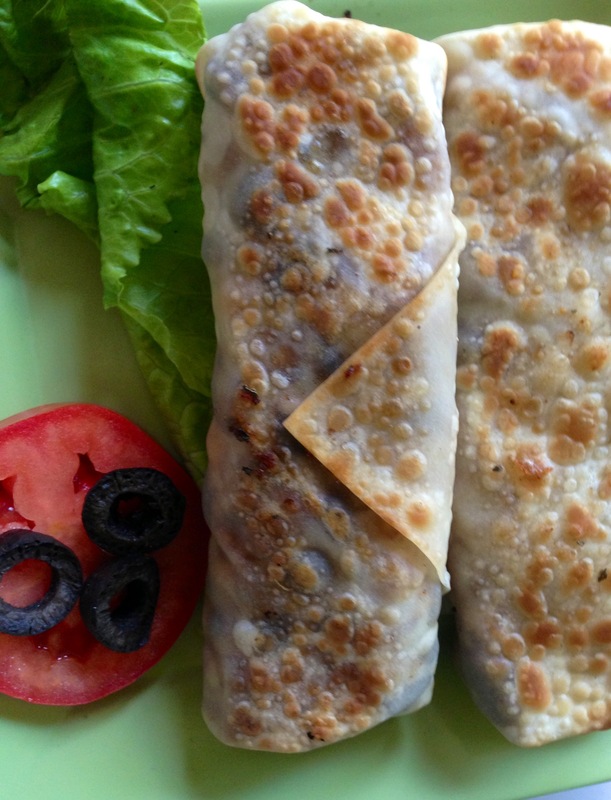 Another egg roll wrapper recipe comin’ atcha! Why? Because I had a bajillion of them and a hankering for some crispy appetizers! 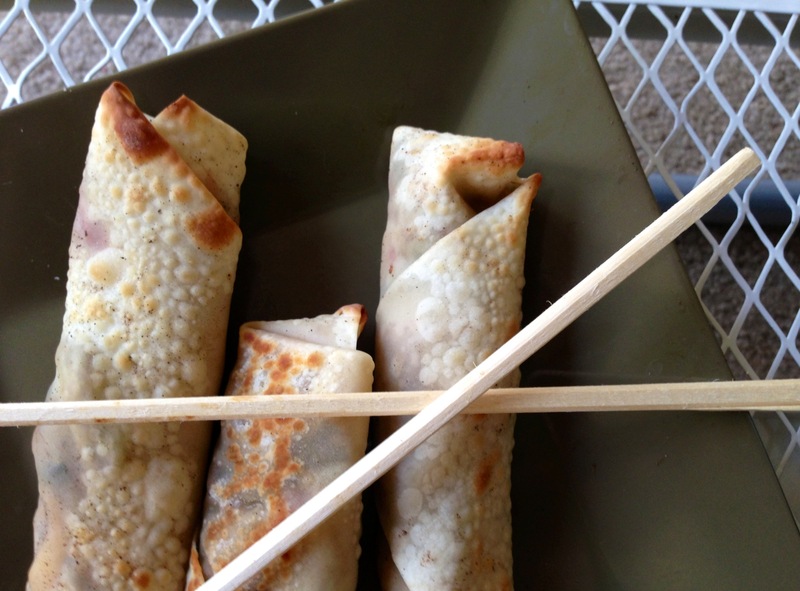 Yes, the egg-roll-wrapper saga is not over. And I question whether or not its crispy goodness should. 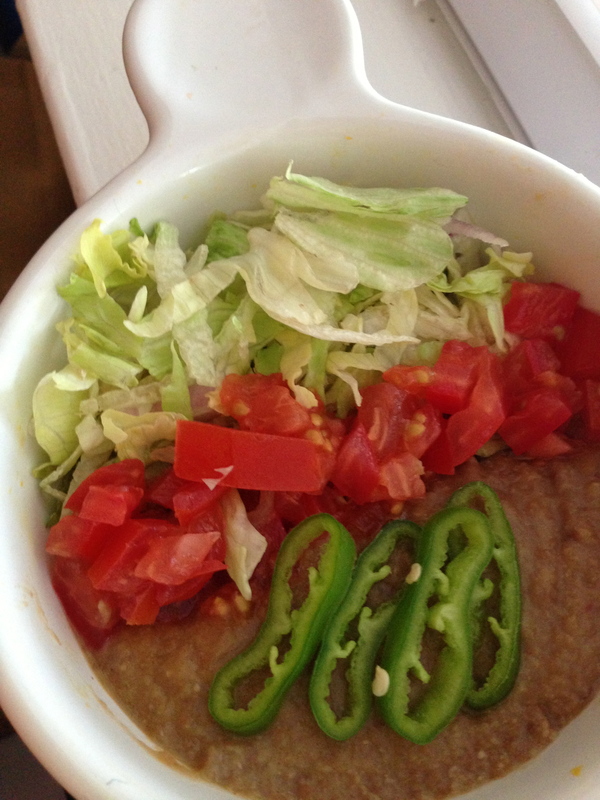 Since I’m headed to Texas, I thought I’d try a Tex-Mex recipe, for festivity’s sake. 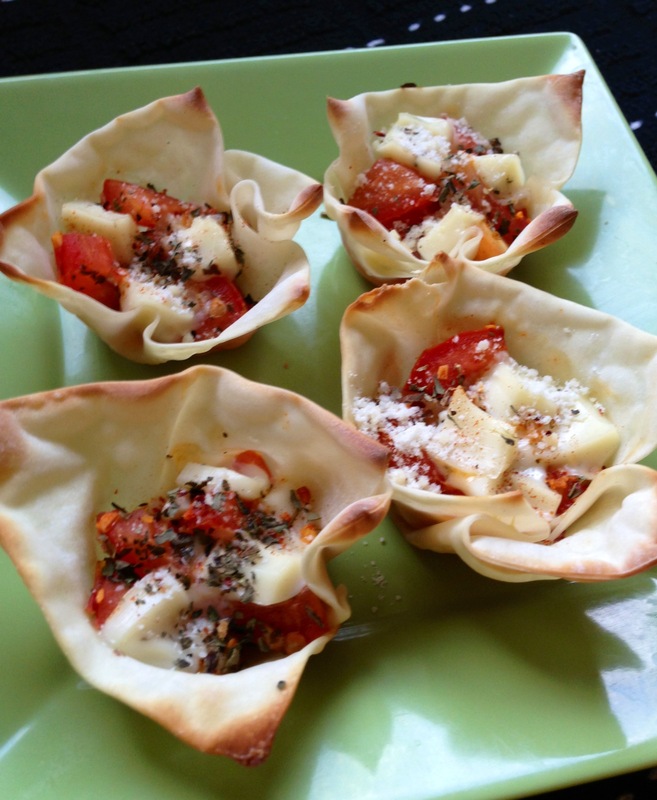 And like anything I do, this recipe is simple, easy, and fast. Planned for the live-alone girl (or guy) in mind, and made to pack a flavorful pop the “Everything’s Bigger” state can love. Preheat oven to 375 degrees. Lightly grease a cookie sheet. Set aside. 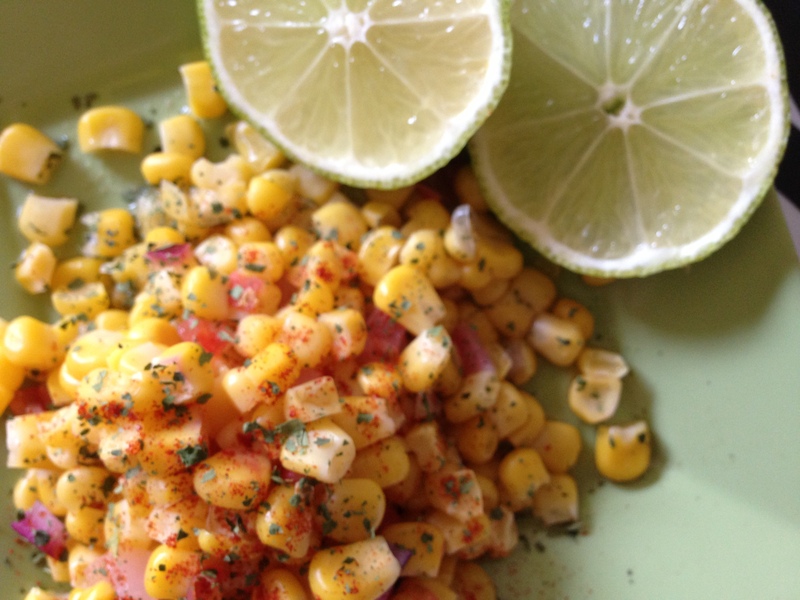 In a small skillet, combine beans, corn, tomato, onion, garlic, spices, and lime. Saute until veggies appear fully sauteed and seasoned. 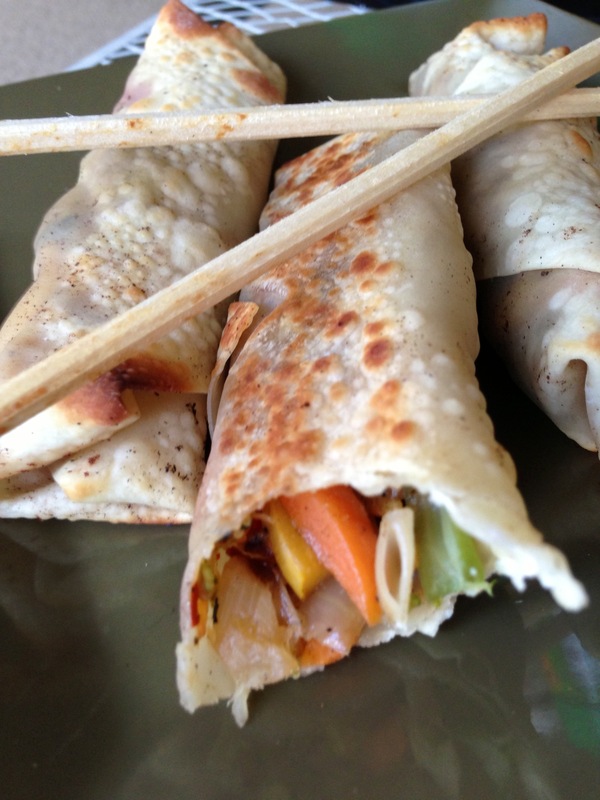 Transfer veggies to your four eggroll strips. Parcel out less than you think to each. Divide evenly, but “eyeball,” as my mother would say, to see if you might add a bit more. Before you start to roll, be careful to overlap to create a longer roll and make sure the ends connect up so none of the filling comes out. This is also why you have to underestimate how much veggie filling is needed because more often than not, you’ve added more than can fit. 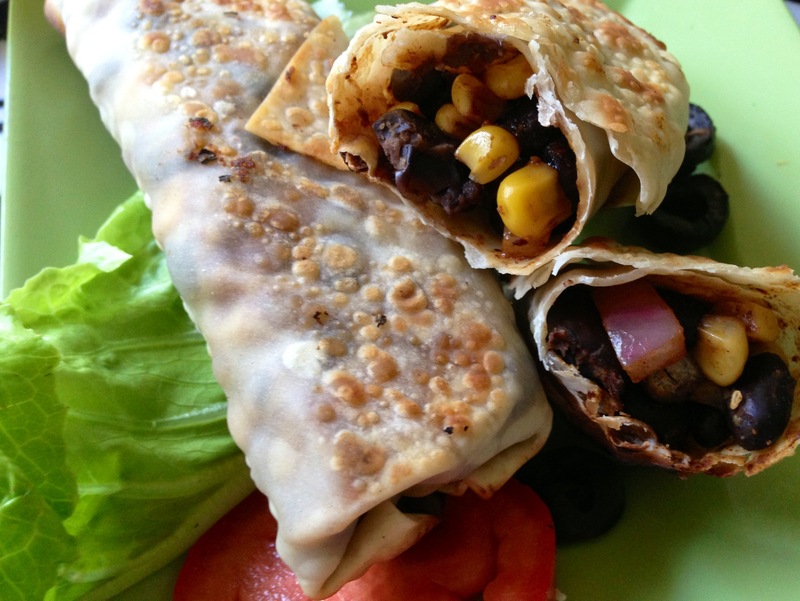 Bake until crispy and the wraps start to flake up with air bubbles. Serve hot in cool dipping sauce if you like. Que bueno! Guess who was still trying to eat her way through 20+ egg roll wrappers after a month or more of coming up with egg roll wrapper ideas? When my own creative mind fails, Pinterest does not. 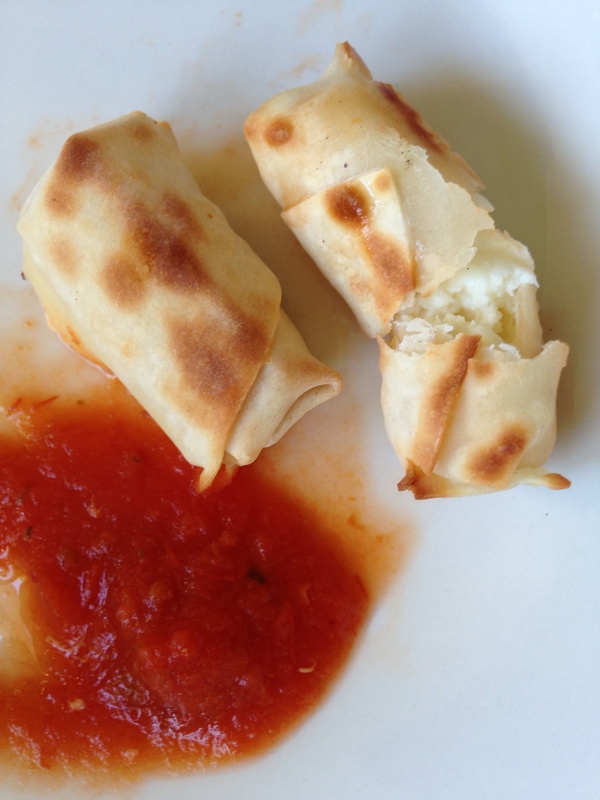 I took to the pin boards and happened across lots of recipes using cheese sticks to make baked mozzarella bites with an egg roll wrapper coating. I’ve already tried the breaded bites, so I thought why not the wrapped ones. Let’s see which is better. Well to no surprise, they were both equally good. I think my baked mozz bites made with whole-wheat breading looked a lot prettier, but these had a nice crunch. 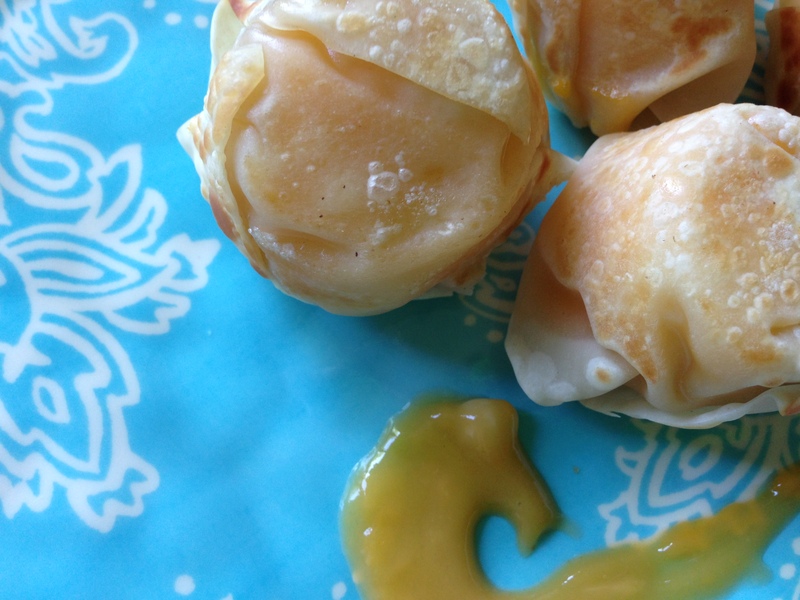 And these egg-rolled-wrapper ones are super quick, easy, and mess free. If you’ve got some wrappers to use or company coming over and not a lot of time on your hands, I’d go for these. Preheat oven to 425 degrees. Lightly grease a cookie sheet. Set aside. 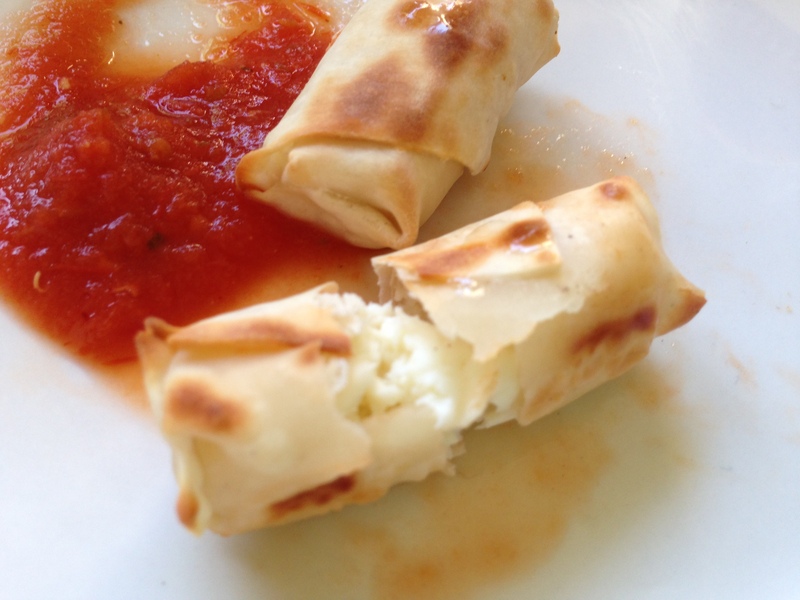 Cut the cheese sticks into three equal parts. Lay on one edge of the egg roll wrapper, and then slice the wrapper into three’s, too, to fit with each of the mini sticks. Roll up! I rolled mine sort of at an angle and then tucked in the sides at the end. Use a drop of water or less to seal the egg roll wrappers in place. Bake for 6-8 minutes or until golden brown and crispy. 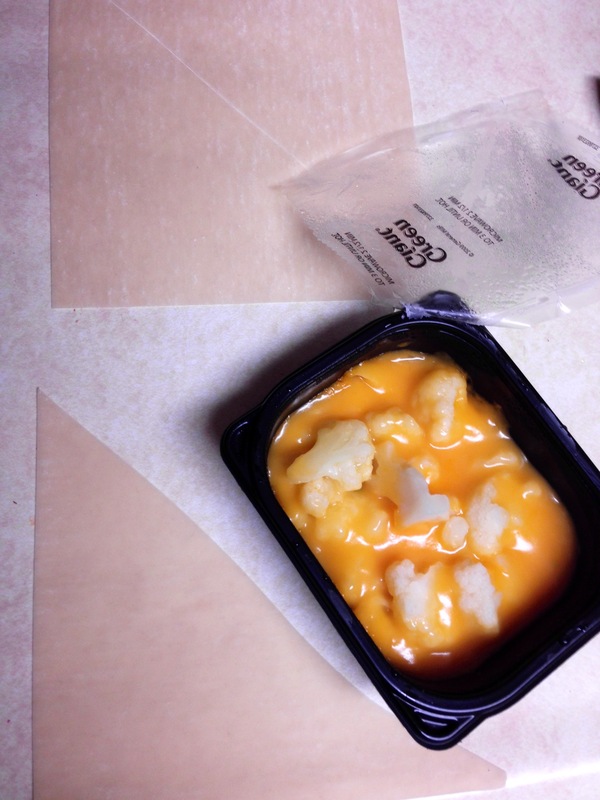 The cheese may begin to bubble out of the sides, and if so, that’s just a sign that you did something right. They’re ready to go! 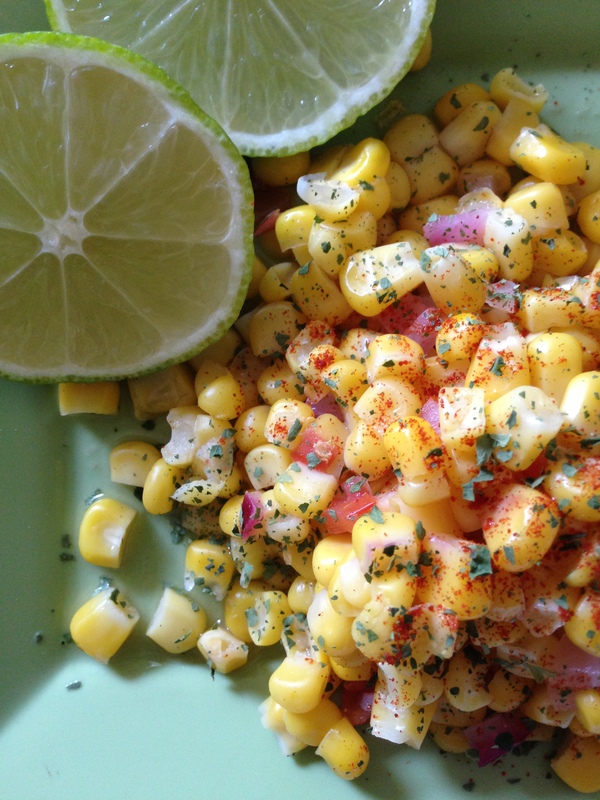 One of my favorite nutritionist bloggers, Snack Girl, was bragging one July morning on her Easiest Corn Salad. It did look easy and tasty. Of course I had to try it. But with my own twist of course. Snack Girl’s was more of a salad, whereas mine is more correctly identified as a corn side with a little cilantro sass. I’ve changed some of the ingredients to make a side that has a hint of sweet alongside herby cilantro and zesty lime. I quite like the outcome. Per usual, this recipe makes on serving, but you can make more. 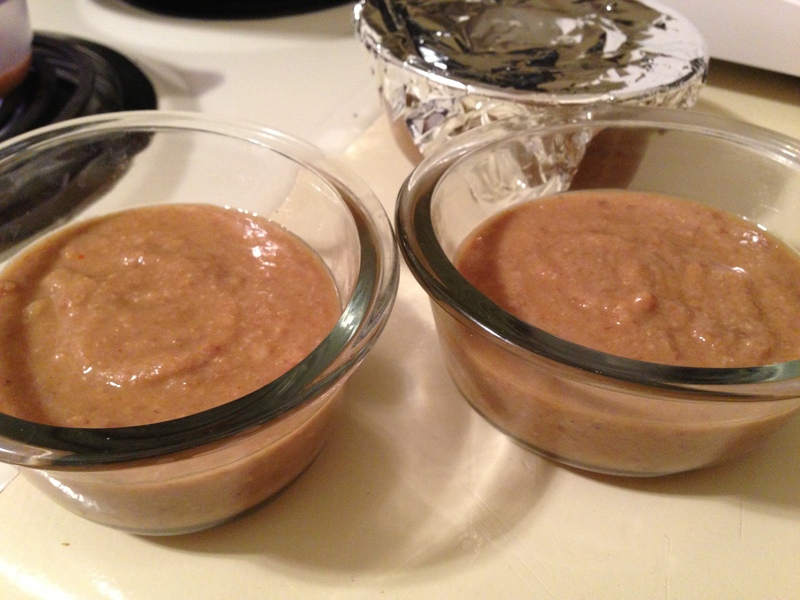 See Snack Girl’s post for resizing or comment below if you need help adjusting. 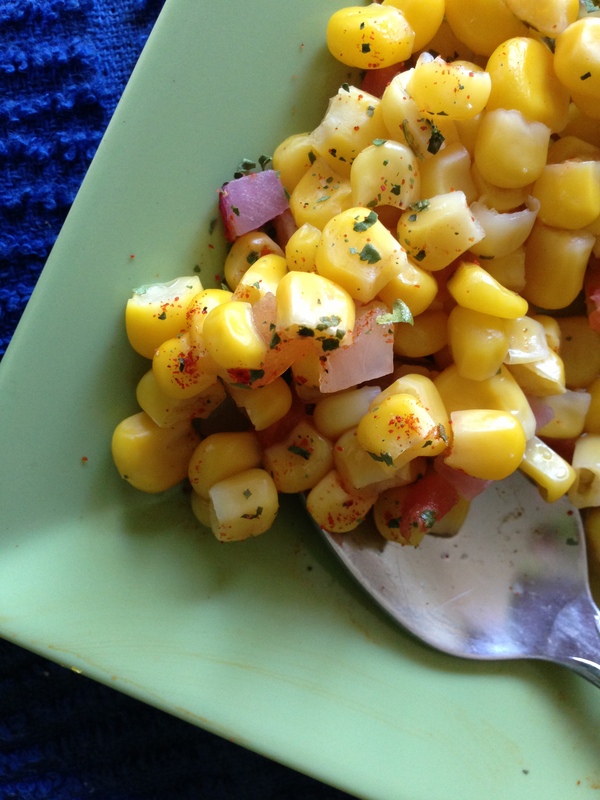 Simply combine the corn and veggies. Squeeze lime over the top. Sprinkle on the stevia and add in the cilantro. Top with paprika and more cilantro, if desired. Enjoy! 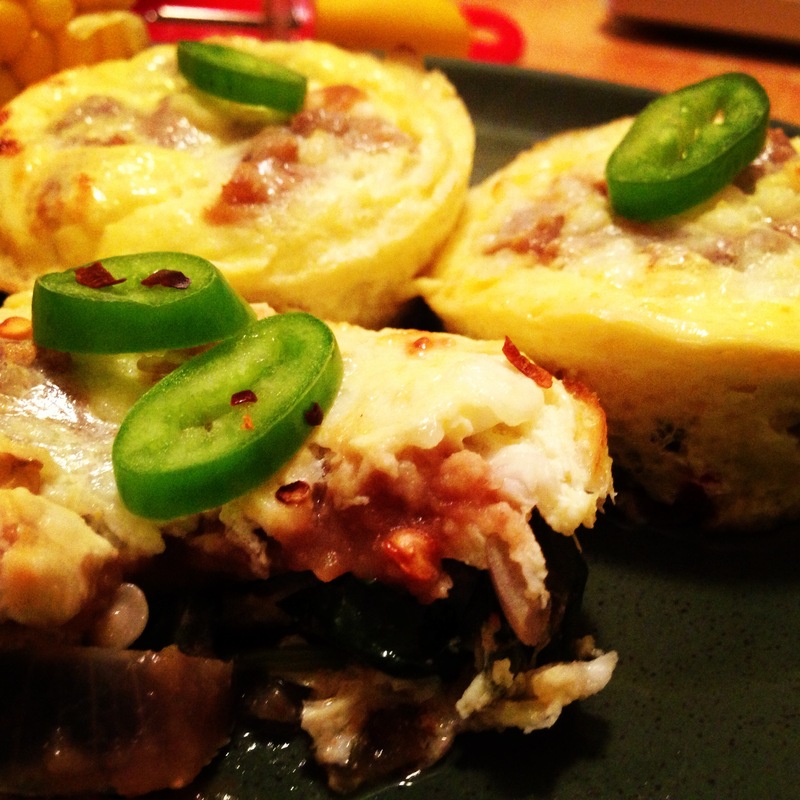 It started with those zesty Mini Fajita Bowls. It may have spiraled out of control. But just maybe. Because now we’re moving into desserts. The things my brain comes up with. I’m not clever, but I’ve got an unusual resourcefulness (I’m also quite cheap or “thrifty”) and an unwavering interest in trying new culinary creations. I like this one. 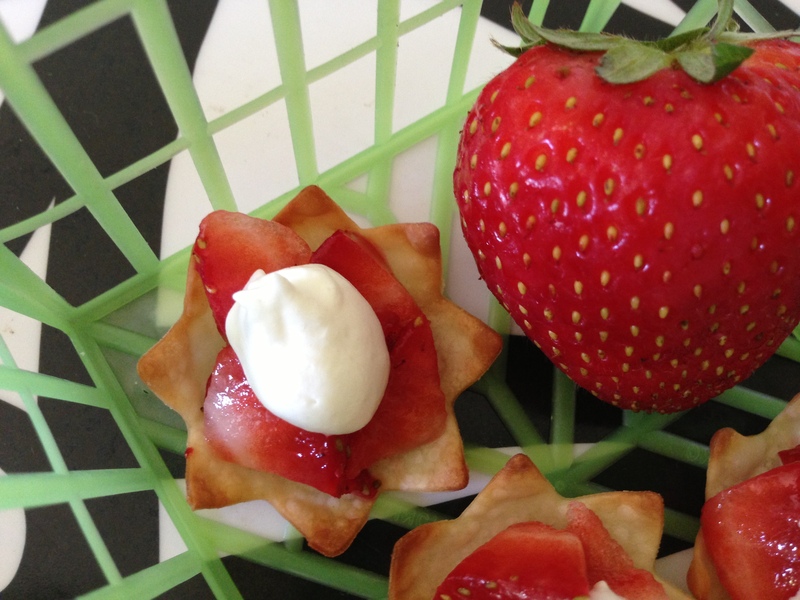 The wonton wrapper forms the base of shortcake and gives it an interesting contrast in flavor. I still can’t quite explain it. Not quite a slight of saltiness, but something along those lines. 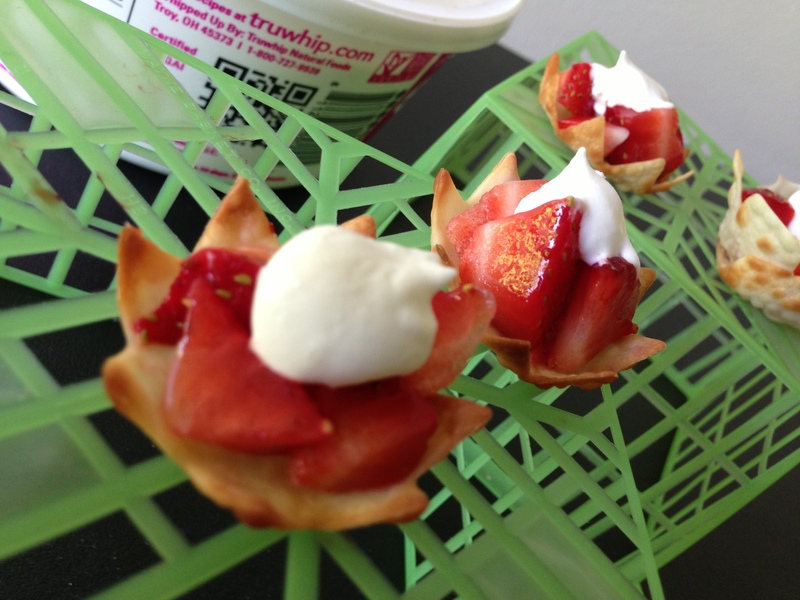 And of course, who doesn’t love some fresh chopped strawberries and a little whipped cream? No, I don’t do Cool Whip. Those sugars and preservatives aren’t kosher with me (or my stomach), but in small does my tummy can handle this wonderful product called “Tru Whip.” I love it. Pick it up in your health food section or store next time you’re ready to call it quites on a recipe that calls for Cool Whip and offers no alternatives. Sweet with a little cream and crunch. Perfect. Preheat oven to 400 degrees. 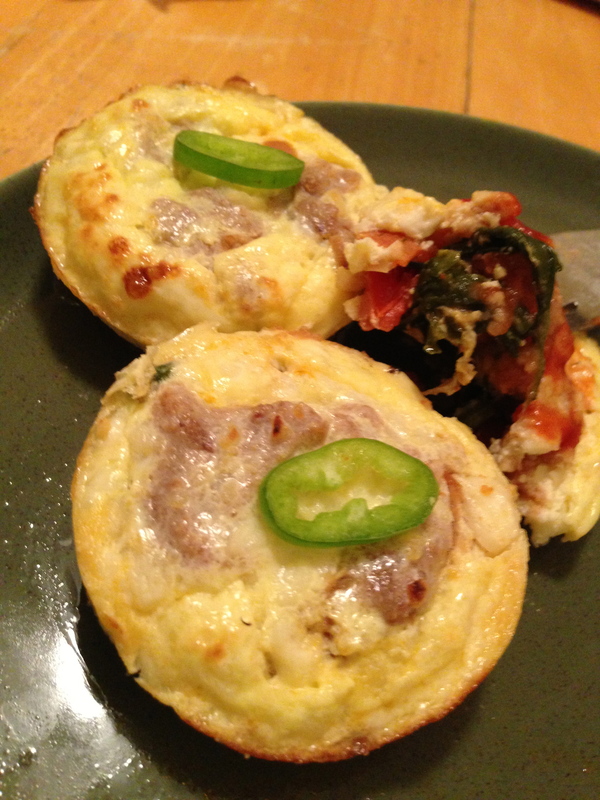 Lightly grease a mini-muffin tin. Set aside. Using a cookie cutter you like, cut as many shapes out of the egg roll wrapper as you can. I got four with a a small flower cutter, but a slightly larger one would have been perfect. Circles and other shapes would work great, too. Tuck wrapper gently into each tin slot. Bake until crispy and golden brown, only about 3-5 minutes. Watch carefully. Remove and let cool. 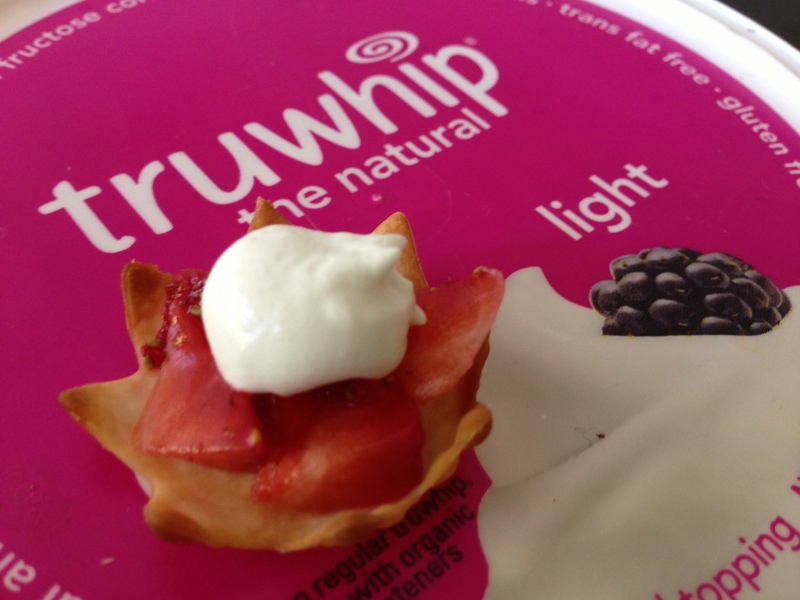 Once cool, spoon even amounts of strawberries into each and finish off with a pretty dollop of Tru Whip. Enjoy the sweet crunch! 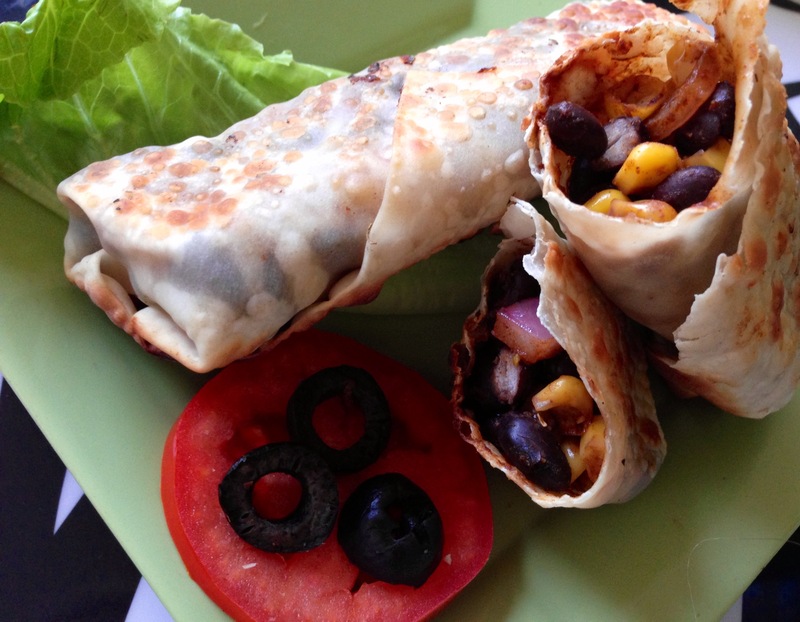 Ever admired an egg roll for its fresh veggie crunch? I have. What I’ve loathed, though, is the fact that the crispiness is usually fried. You know how I feel about that. NOT a fan. I love my arteries a bit too much. Everything’s better when you make it to your liking. 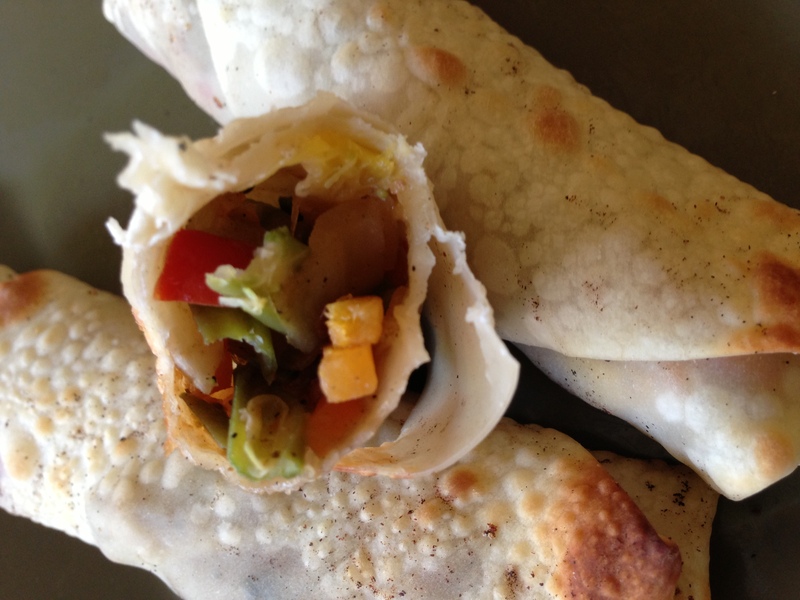 I wanted a crispy, unfried roll with stir-fry-like veggie filling. 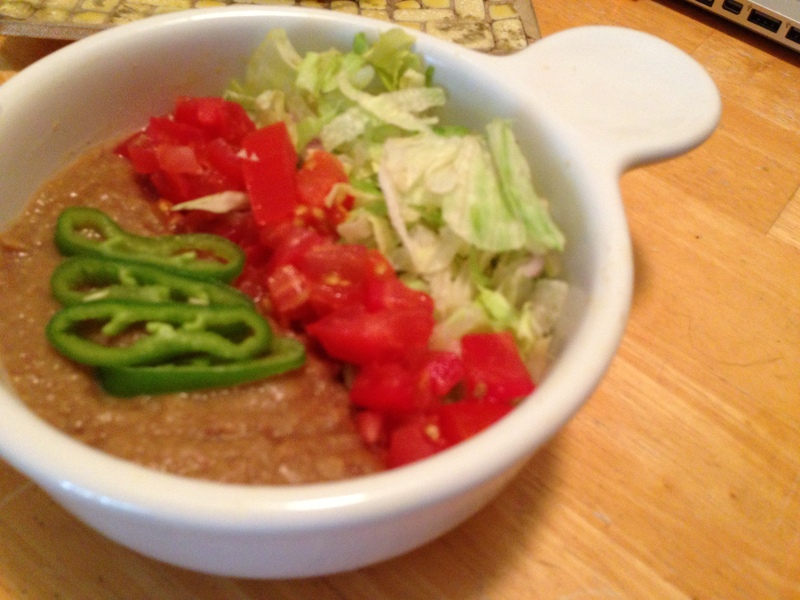 You could modify the half-cup of veggies with rice, meats, beans, essentially anything you like. 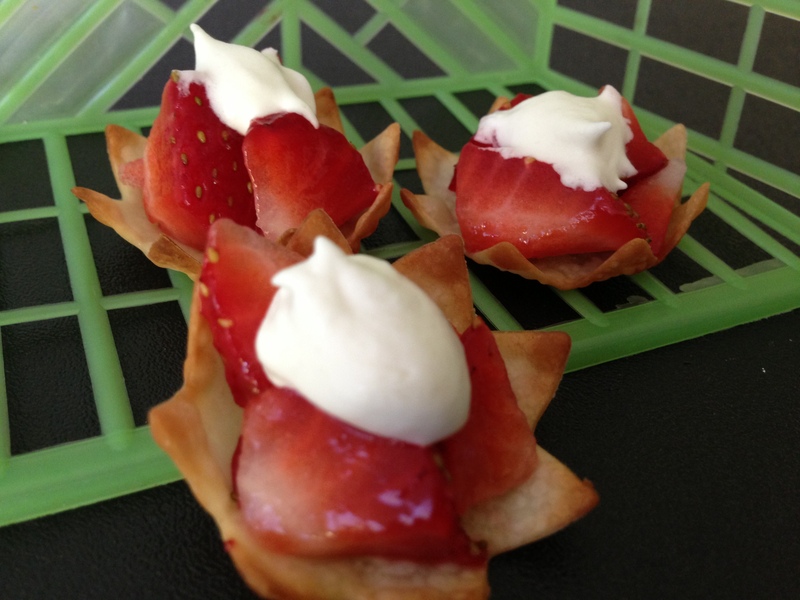 Have fun, experiment, and make it something you would want to eat. Preheat oven to 350 degrees. Lightly grease a cookie sheet. Set aside. 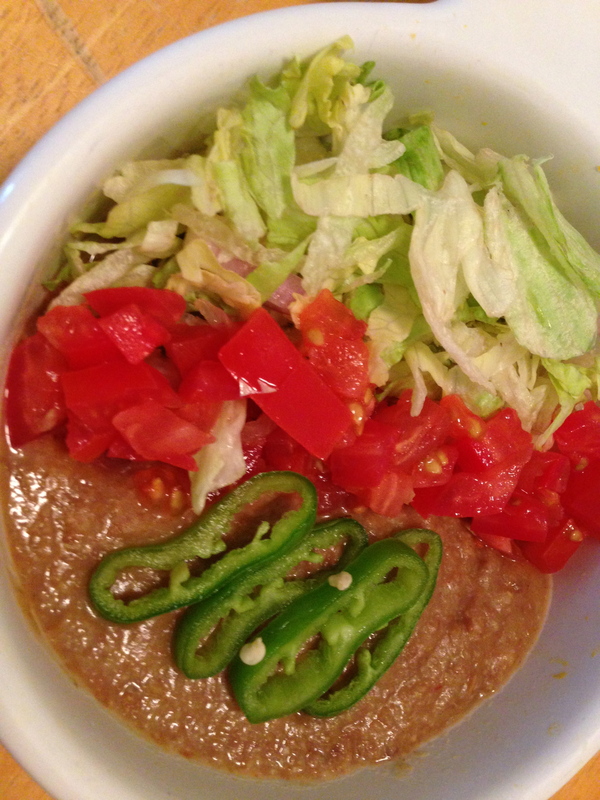 In a small pan, fry up veggies in soy sauce, and then mix in ginger, red pepper, and dressing if you’re using that. Saute it up on high ’til tasty coating forms, then turn down to low after a few minutes. Juices will begin to thicken. Let saute a few more minutes. When ready, evenly distribute the veggies on the three wrappers, laying them out in a thick line. At the ends of each line, fold edges in. Flip one of the adjacent edges over and roll. You’ll roll ’til you can’t roll anymore. Flip the egg roll over on its side or seal with a dab of water so the wrapper holds (but not much). Bake for about 8-9 minutes or until golden brown. 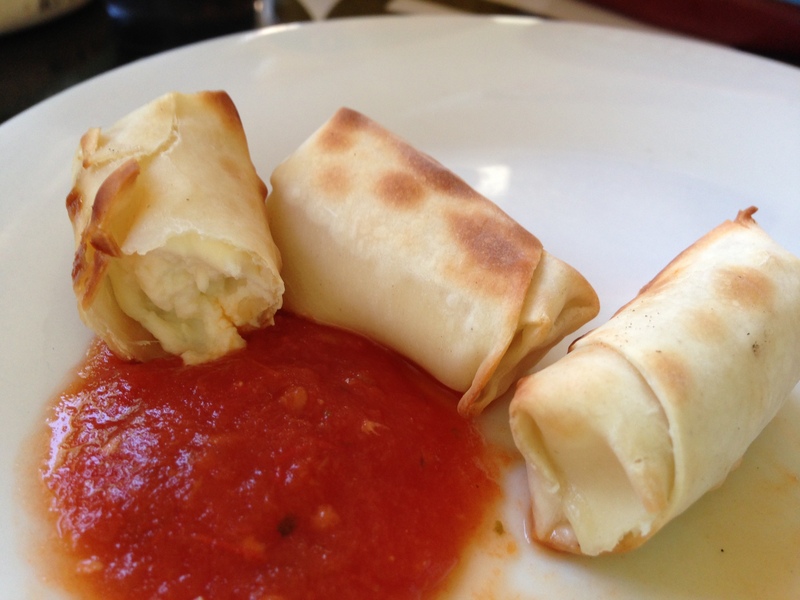 Serve warm with your favorite dipping sauce. Hope you love it! I definitely want to try it as an appetizer for a group. Welcome back to a satisfying salads: Garden of Eden Edition! 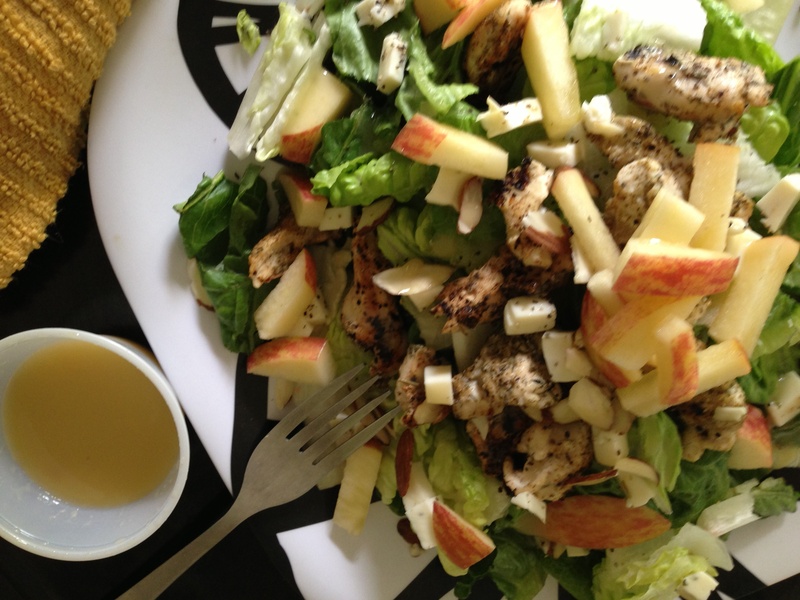 Like the Sesame Steak Salad I crafted in June, this salad has plenty of protein to keep you full and feeling satisfied. No skimpy salads to be had. 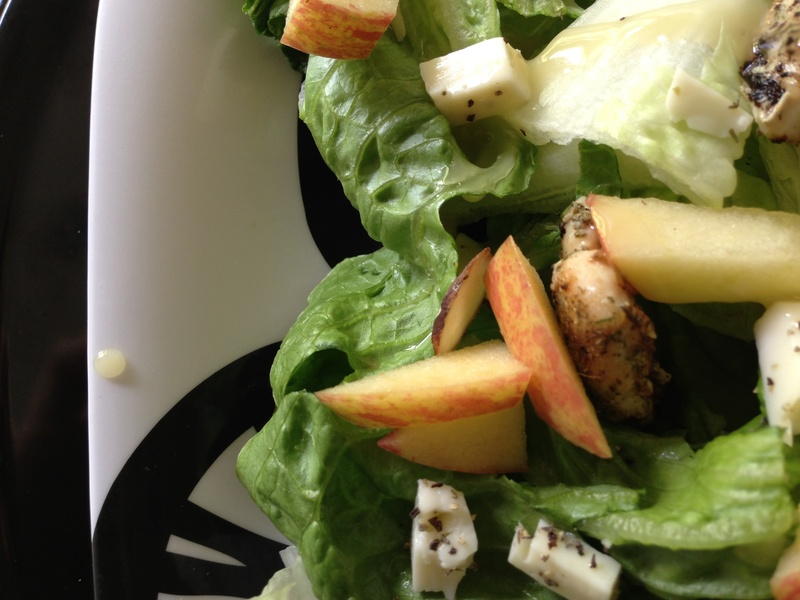 A cheesy introduction for a salad that isn’t cheesy in the hokey sense, but is in a Gorgonzola-and-fruit pairing fantastic one. On a trip to KC earlier this summer, I was pleasantly reunited with my favorite salad, ever. I realize I’m speaking in hyperboles beyond reason, but forgive those and believe that the Garden of Eden Salad from The Mixx restaurant in Kansas City, Missouri is special. 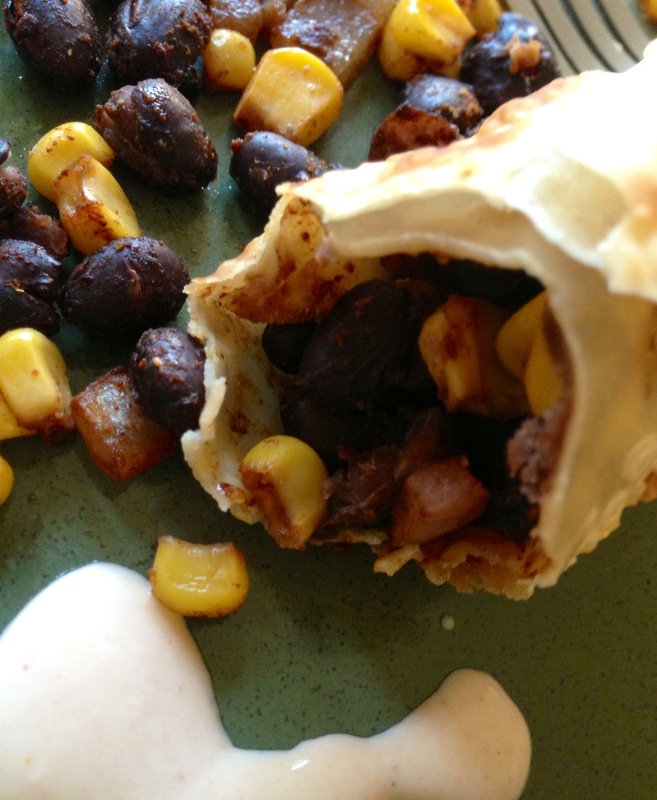 If you like savory-sweet combinations, you’re sure to love the savory-sweet ingredients tossed in this one. 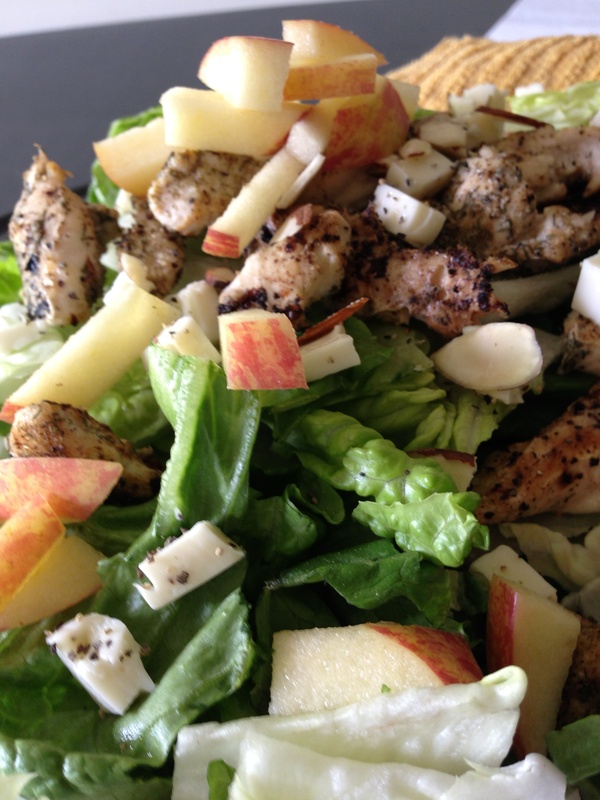 We’re talking cheeses, fresh apples, pecans, grilled chicken, and a champagne-honey vinaigrette that can’t be matched. The downside for those wanting to try this recipe at home? I’ve yet to find a recipe or substitute dressing that stands up to the deliciousness of The Mixx’s. As you’ll see in the pictures, I saved a little cup from The Mixx and brought it back home with me. The good news is that the most comparable dressing I’ve found can be bought at Trader Joe’s, TJ’s Champagne-Pear Dressing. Very good, that one, and it comes with small chunks of bleu cheese I believe. So your cheese and nut selections for this one can range. The Mixx uses Gorgonzola and candied pecans. For my slightly less sugary version, I used slivered almonds and chopped garlic-herb cheese. I also used a fresh Fuji apple, but a Granny Smith would do, and a Pink Lady would be equally delightful. Toss all ingredients until dressing and cheese coat the salad leaves. 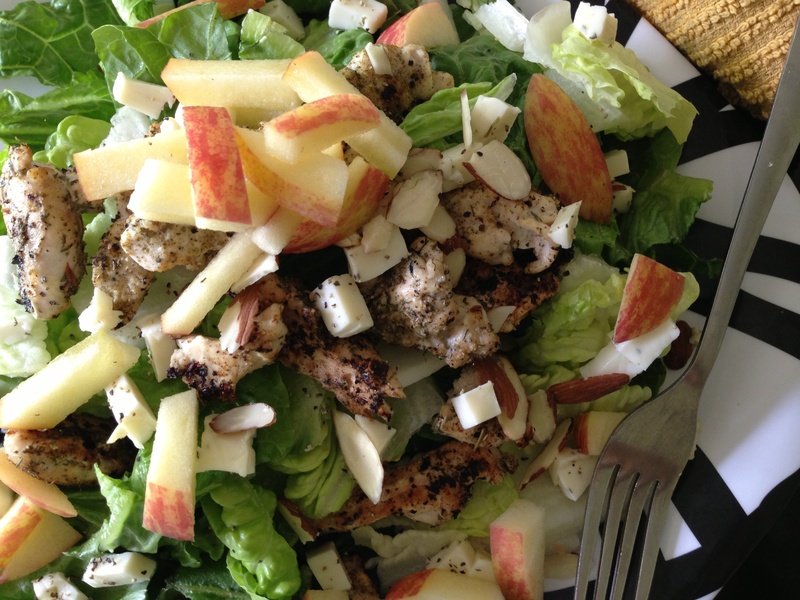 Or if you’re like me and prefer layers in your salad instead of a mix, start with salad base, and then top with nuts, cheese, chicken, apples, pepper, and finally drizzle dressing on top. So continues my obsession with egg roll and won ton wrappers. 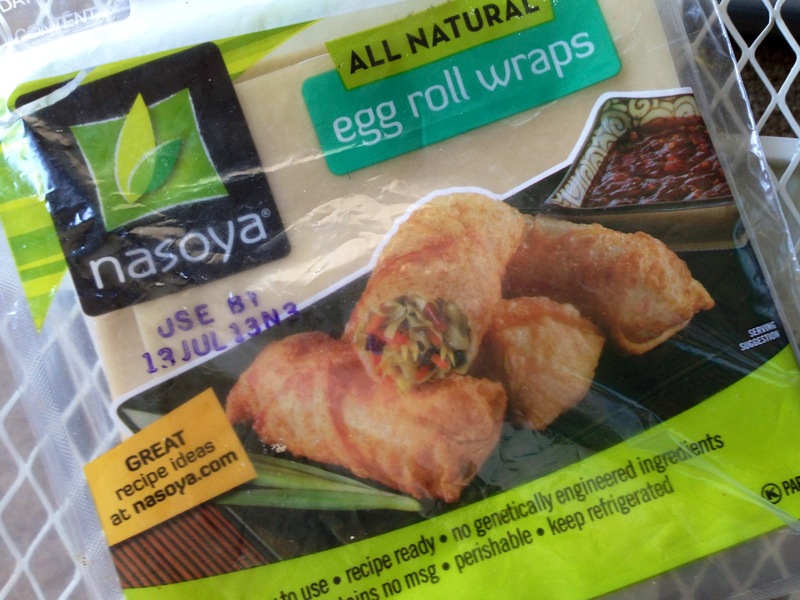 If you’ll recall my post “Appetizer Idea: Bite-Sized Fajita Bowls,” I picked up a pack of Nasoya egg-roll wrappers at HyVee. It’s been true love ever since. 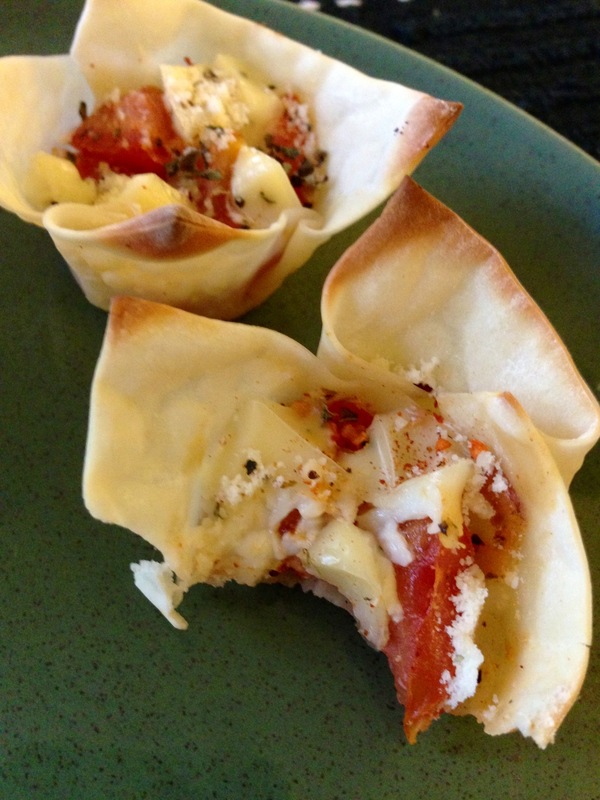 Another one of the won-ton wrapper apps I see floating around on Pinterest.com features a combination of tomato and mozzarella. For this first one, I wasn’t feeling mozzarella. I’ve been using a soy-based garlic-herb cheese a lot lately, so I crumbled that over the top instead, tossed in some basil, parm, and spice, and felt my eyes roll back in my head when I tasted the crispy-cheesy-flavorful crunch of this appetizer. Hope you get a pow in the yum like I did. 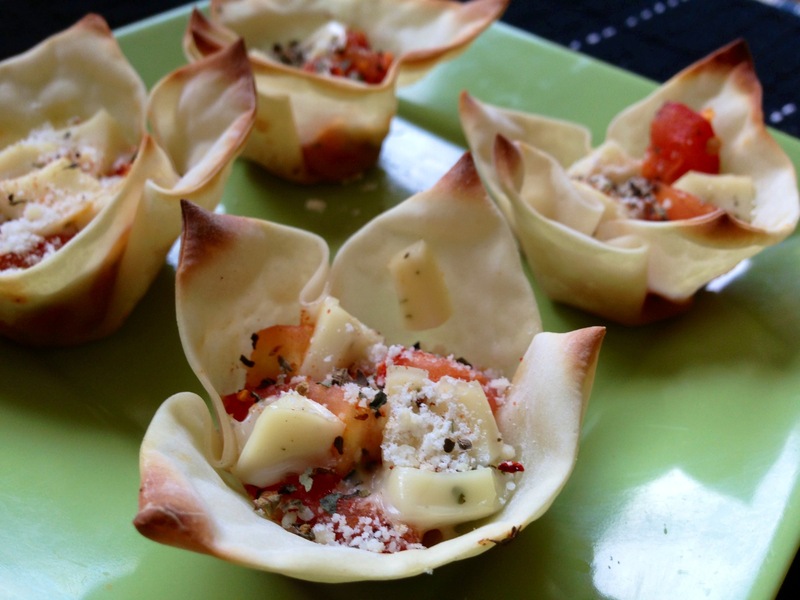 These appetizers are right up my alley. I’m sure I’ll continue to make them for myself, but I suspect they might become my new favorite stand-by for potlucks and dinner parties, too. Very easy, and very good. 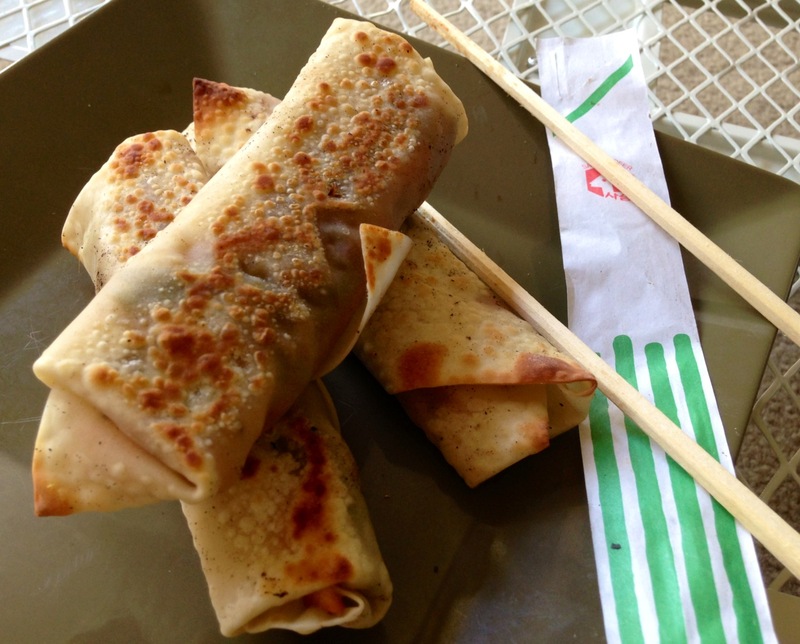 Take the egg roll wrapper and slice into four equal squares. Press into pan, folding sides to fit down as necessary, but not pushing too hard. In a small pan, saute the tomatoes in a little cooking oil for a few minutes, adding in the basil, then the red pepper flakes. Evenly distribute among the wrappers. Bake for about 7 minutes or until edges of wrappers turn golden brown. 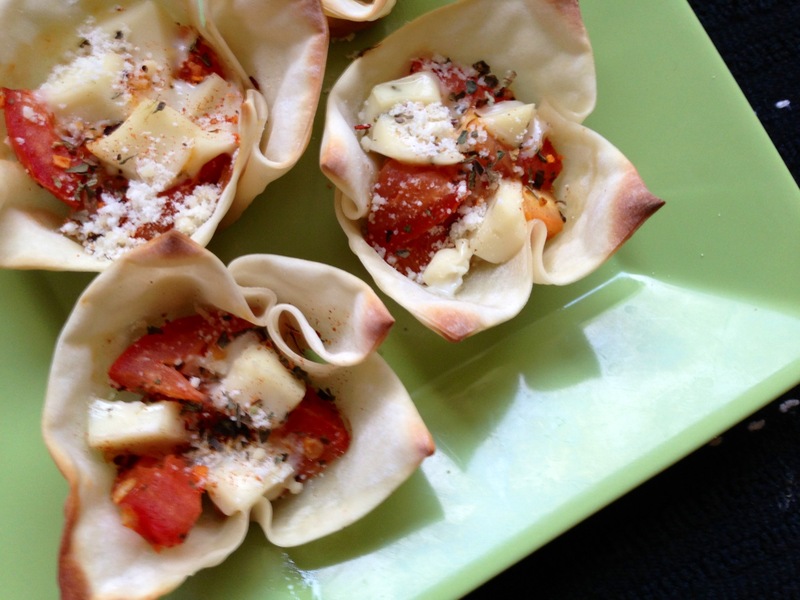 Top with cheese of choice (cubed or crumbled), dash of parm, and more basil if you like. Bake another 2-3 minutes until cheese melts. Serve right away and warm, if possible. Enjoy!